Lil' Peach 5-year confetti dot pink baby memory book, has 46 fill-in pages to record all of baby’s special moments from their birth to their 5th birthday. The adorable pink and orange polka dot book includes an opening for your favorite 3" x 3" photo of your little one. Have fun adding in every special detail about baby from their birth to their homecoming, their favorites and firsts, and their birthdays. This guided journal makes it easy to not miss a beat of baby’s first few years. This special keepsake book also includes an area to fill in baby's family tree and the story of mommy and daddy. Place your favorite photos of baby girl, mommy, daddy, and more throughout the first few years of their life inside this guided journal. The pink and orange details make this great for baby girl, so don’t forget to add it to your registry! You’ll love having this keepsake for years to come. Be sure to not miss a single moment of baby’s precious first years and cherish Lil' Peach 5-year confetti dot pink baby memory book forever. Product dimensions: 9" W x 10.75" H x .63" D; Photo insert: 3" x 3". This pink and orange babybook is perfect for baby girl! It's decorated in pink with orange and white adorable accents and polka dots. The orange ribbon and pink design around the photo insert adds a too-cute touch. 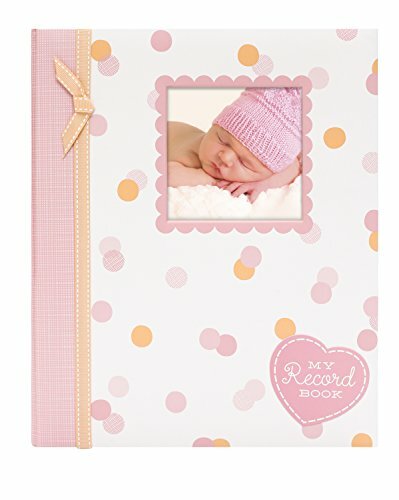 "My Record Book" is printed on the cover in a pink heart, adding an adorable finishing touch. Don't forget to add this adorable book to your baby girl's registry. It's a great baby shower gift to give anyone expecting a baby girl! If you have any questions about this product by Lil Peach, contact us by completing and submitting the form below. If you are looking for a specif part number, please include it with your message.